Saint Francis Medical Center’s Fitness Plus placed second in the Worldwide Walking Challenge sponsored by the Medical Fitness Association. Fitness Plus recruited more than 700 participants who took a total number of 50,377,895 steps during the week-long challenge. Fitness Plus will be recognized for this accomplishment at the organization’s Annual International Conference in Orlando in November. The Worldwide Walking Challenge encouraged participants in their communities to walk 70,000 steps in seven days during the 10th Annual Medical Fitness Week, April 28-May 4. Each participant wore a pedometer and kept track of the number of steps they took each of the seven days. The UNC Wellness Center in Chapel Hill, N.C., placed first in the challenge with 68,447,927 steps. 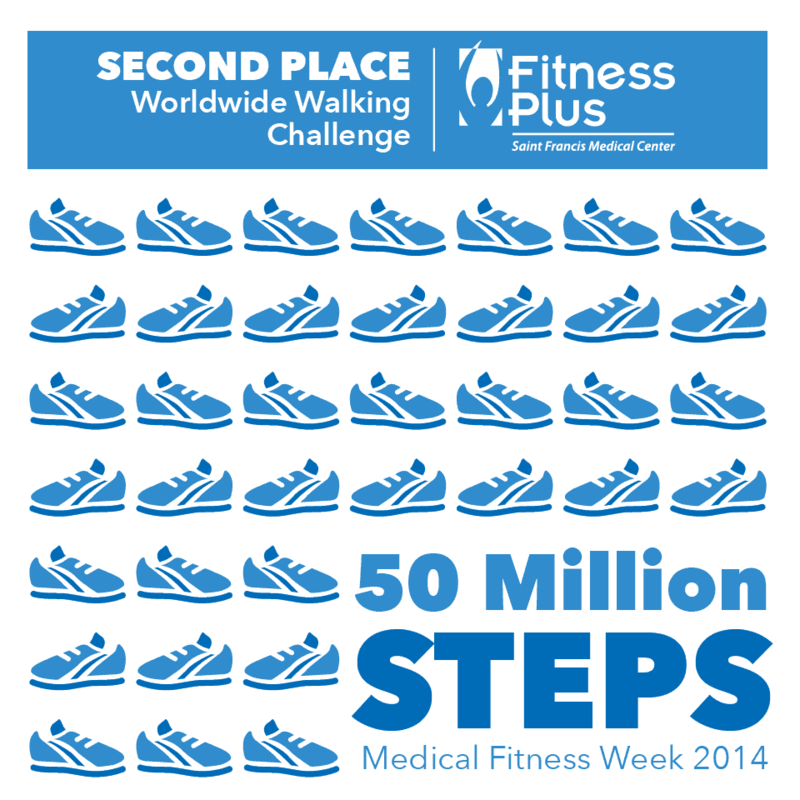 The Fitness Plus team placed second in 2013 as well, with more than 38 million steps. That year, the winning team had 49 million steps. “It’s the little things in our everyday lives that matter,” says Doug Friese, director of Fitness Plus, “Every step counts in improving health and overall wellness.” He credits much of Fitness Plus’ success in the competition to two staff members, Dianne Lawrence, BS, AFAA, assistant manager of health and fitness, and Billy Van Pelt, AFAA, lead fitness specialist, who coordinated the effort. “They are dedicated to the wellness of not only Fitness Plus members but also the community,” says Friese. The Medical Fitness Association is a member driven, nonprofit organization and was founded in 1991. Its mission is to respond to the needs of medically integrated centers and help them reach their full potential by providing industry standards and benchmarks.